as he lands thirty Carp from Cherry Lake! As mentioned in an earlier update, Tom Nixon-Taylor had an amazing stay in Osprey Lodge on Cherry Lake and I promised a dedicated story once I got some photos. Well Tom has gone better than just photos, he has made a video too! This can be found on You Tube and is titled ‘Cherry Lakes Cirencester carp fishing 2018′. It is hosted by Karper TV, and you can see it here! 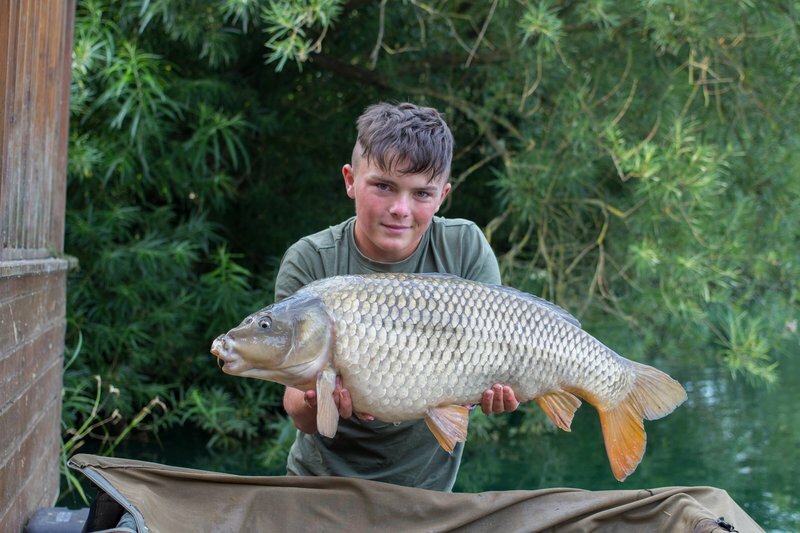 It is worth watching because Tom tells the story of an amazing ten days on Cherry Lake when he caught 30 Carp (around 10% of the Carp in Cherry Lake) including two upper thirties. A 38-04 and 35-04 Mirror, both of which are pictured below. Whilst Tom is ‘only’ 16, he is a very accomplished and very keen angler. He is also a natural in front of the camera. The video is particularly helpful because he takes time to explain some of his successful tactics. Impressively given that he was catching regularly, he was not afraid to experiment. 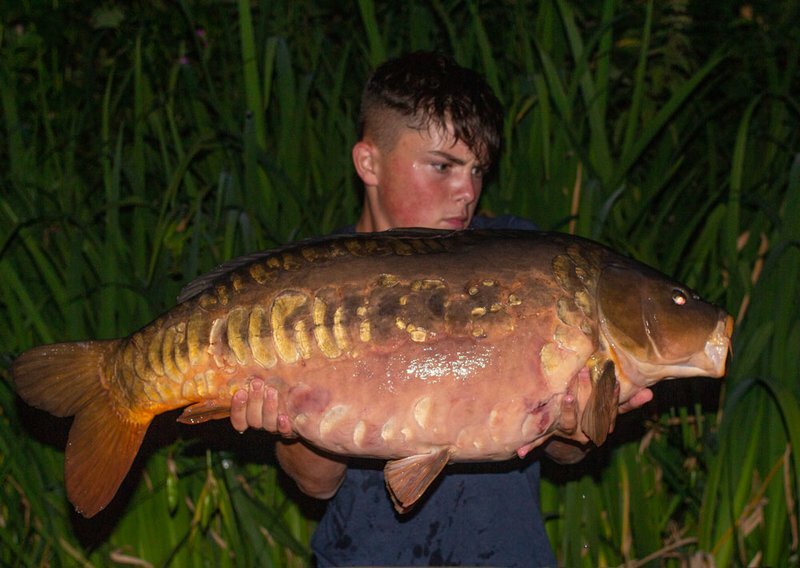 Indeed both of the thirties came after he changed tactics……and up to this point he had already caught over 20 Carp. He explains this is detail on the video. To show that Tom’s catch was no flash in the pan. 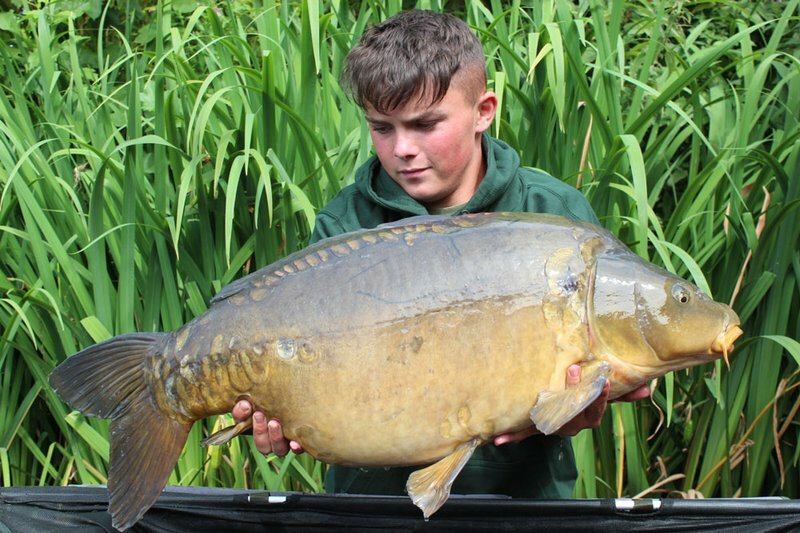 He did very well on his first trip to Cherry Lakes, which he made with his Grandparents last year, when he caught well including landing a Mirror of 35-04. Amazingly it was the same fish that he caught this year at 38-04 to set his new PB. Tom was already a member of the 30+ club, but he was pleased to get his 35+ hoody! It is interesting how sometimes it is the smaller carp which feed and/or dominate an area and other times when it is only the big Carp which pick up your baits. I kept saying to Tom, That he was ‘unlucky’ given the high proportion of doubles (most of which I think were male fish), and that if kept catching he would get through to the bigger fish. He certainly proved my point because over his last couple of days he had four 26′s plus the two thirties in the last 10 Carp that he caught. I have been spoilt for choice for photos as Tom kindly sent me through some great shots. As well as the two thirties I have included a couple of my favourites below.